While we’re still four weeks away from finding out how Spider-Man is resurrected for his next solo outing, Avengers: Endgame star Robert Downey Jr. has already brought us a reunion of sorts between Tony Stark and the wall-crawler. 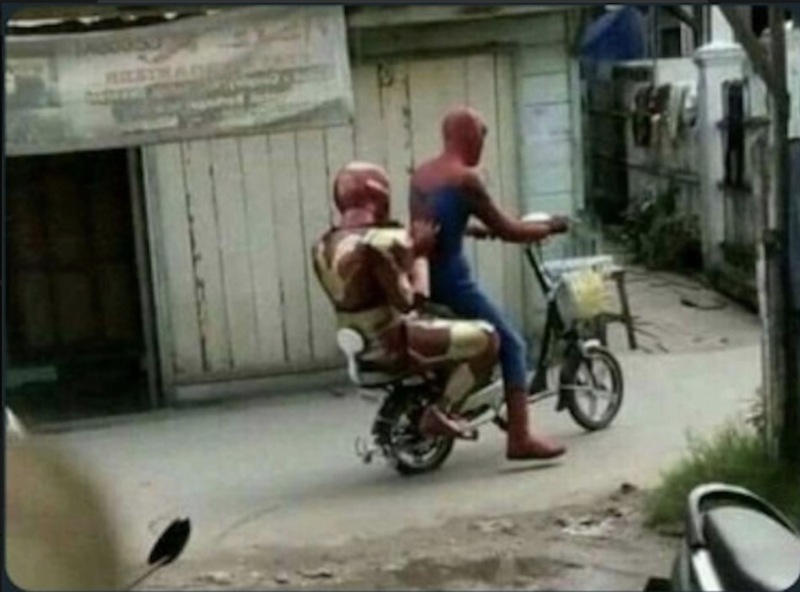 While something tells us that this isn’t an actual photo from the set of Endgame, one fan responded with the observation that Holland did indeed tweet back in August of last year that he’s “officially buying a motorbike,” making the pictured scenario almost plausible. Of course, Peter Parker is in no position to give rides these days, having turned to dust at the end of last year’s Avengers: Infinity War. Nonetheless, it’s widely assumed that next month’s sequel will see his death reversed, not least because Spider-Man: Far From Home is scheduled to drop later this year, and has already been confirmed by producers Kevin Feige and Amy Pascal to take place after Endgame. As for Iron Man, it’s currently looking very likely that Peter’s mentor is dropping out after this next film. And while this could well mean a peaceful retirement for Tony, it remains a popular prediction that the character’s run might end with his demise. We’ll find out if tragedy awaits the MCU’s first hero when Avengers: Endgame hits theaters on April 26th, before Spider-Man: Far From Home comes out on July 5th.